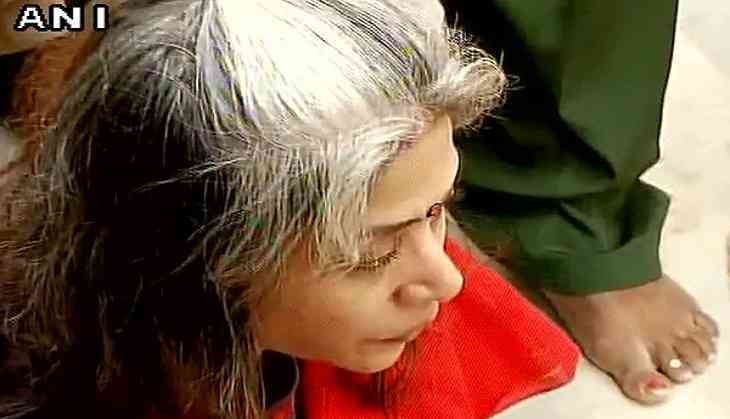 A special CBI court on 28 June allowed Sheena Bora murder case accused Indrani Mukerjea to lodge her complaint against Byculla Prison officials after she was allegedly beaten and threatened of sexual assault for protesting over the death of a woman convict there. Indrani, who has been booked for rioting in the women's prison here along with other inmates, was today produced in court after she moved an application yesterday alleging that she was roughed up by jail officials when inmates protested the death of a 45-year-old woman prisoner Manju Govind Shette. Special CBI judge J C Jagdale today said that Indrani be first taken for a medical examination and later to the police station (Nagpada) to file her complaint. Yesterday, the CBI court, which is hearing the Sheena murder case, had directed prison authorities to produce Indrani before it today. Today, narrating the incident, Indrani told the court that she was threatened and assaulted after she said that she will give a statement (in connection with the case) to a magistrate under the provisions of section 164 CRPC, which unlike a police statement is admissible in court. Indrani also said that she had witnessed the woman prisoner being allegedly assaulted. She said that when she first inquired about Shette's health (prior to her death), she was told that she was fine but later she learnt that she passed away. Indrani said that after a case was registered into Shette's death, she came forward as as a witness in the case, and told the jail officials that she is ready to become one. Recalling the events on the day of the protest, she alleged that the superintendent had ordered a laticharge after turning the lights off in the jail. She charged that even male officials in the jail resorted to cane charge on the inmates. "I was hit on the hand and legs... I can barely walk," she alleged and added that the superintendent told her 'tu witness banne ja rahi hai.... tereko bhi dekh lenge'. She said the superintendent threatened her, saying "We will do the same thing that we did to Shette". According to the application filed by Indrani's lawyer Gunjan Mangla yesterday, when she went to meet Indrani, the latter told her that she was beaten up by jail officials after the death of Shette. "She showed me her bruise marks and injuries which were very prominent on her hands, legs and head," the lawyer claimed in the application. Indrani had also informed Gunjan that she was verbally abused by jail officials and the superintendent and was threatened of sexual assault for protesting against the death in jail. Yesterday, Gunjan said Indrani requested her to bring the incident before the court and seek her production to lodge a complaint against the jail officials. "She informed me that several inmates want to give their statements against the jail officials who were involved in the incident," the lawyer said. When judge J C Jagdale asked the lawyer if Indrani wants to file an FIR, she said, "Yes". According to police, following the death of Shette on Friday, the enraged inmates rose in protest on Saturday, some of them went up to the prison's roof, while others made a bonfire of newspapers and documents inside the premises to express their anger. Later, the Nagpada police booked nearly 200 inmates of the Byculla jail, including Indrani, for rioting, unlawful assembly, assault on a public servant and other relevant sections of the Indian Penal Code. An official from the prison department had alleged that Indrani "instigated" the inmates by asking them to shun food and "use their children as shields" when prison staffers tried to stop them from agitating and gathering together. Police says that Manju, whose death sparked protests in the prison, was allegedly tortured and a stick was inserted in her private parts. Manju died at the government-run J J Hospital on Friday night after allegedly being beaten up by a woman official of the jail on June 23. The Nagpada police, investigating the case, have filed an offence of murder against the jail staff. Six jail staffers have been placed under suspension and police registered a case under IPC section 302 (punishment for murder) against them. The jail, located in the heart of the city, houses around 251 inmates.